He's probably the most popular pachyderm in the nation's capital, seen by millions every year at the National Museum of Natural History. But the News4 I-Team has discovered a growing number of experts worry Henry the Elephant's gleaming white tusks could draw the wrong kind of attention. 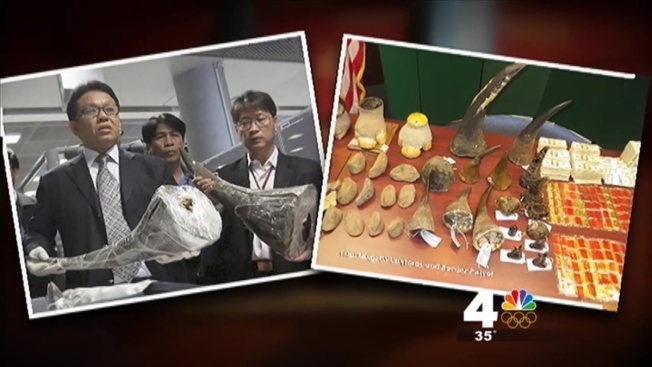 "Anything that a museum or a private collector has that would involve rhino horn or elephant ivory, I think you need to be aware and take necessary precautions," Dan Ashe, director of the US Fish and Wildlife Service said. Dozens of museums throughout the world have been hit by organized gangs stealing rhino horns in recent years, including a German hunting museum. The National Museum of Ireland tried to hide its rhino heads by putting them in storage, but thieves got them anyway last year. "What we're seeing now is a large sophisticated, syndicated criminal network many of whom are also dealing with drugs and arms and in some cases, even human trafficking,” Ashe said. “They're very dangerous, very sophisticated [and] organized." Ashe said a recent break-in at D.C.'s Wilson Building has animal trafficking experts worried the US could be next. Two large elephant tusks, given to the city as a gift from Ethiopia in 1954, disappeared when they were left unsecured inside the District's city hall building. Crawford Allan with the World Wildlife Fund said a tusk goes for as much as $1,000 a pound on the black market and can be worth even more when carved into sculptures desired by wealthy Chinese who crave it as a status symbol. Allan held a small five pound tusk -- not a rhino horn -- to show us what the thieves want. "It would be a risk to all of us personally to have a rhino horn on the premises," Allan explained. He and Ashe both said a large rhino horn is worth as much as half a million dollars. "If you think about it, if a rhino horn is worth more than its weight in gold and you find a rhino horn, that's like stealing a gold bar, right?" Allan said. The World Wildlife Fund says demand comes from Vietnam, where rhino horn is believed to cure everything from hangovers to cancer to erectile dysfunction. "People have been marketing rhino horn as this cure all, this wonder drug," Allan said. “You can go to a rhino horn party and drink a rhino horn cocktail." Allan said a record 31,000 elephants and rhinos died last year for their ivory. It is illegal to trade ivory and tusks over international borders, but the World Wildlife Fund said gangs use timber and other materials to disguise their hauls. US Customs and Border Patrol sent the News4 I-Team photos of large tusks and carved sculpture it pulled out of people's luggage. In the last decade, the federal government's seized more than six tons of confiscated ivory. In November, all of it was crushed into pebbles. "We did it to send a message to the world,” Ashe said. “We need to reduce the demand for these products." He wants Congress to change laws used to prosecute organized crime, like the RICO Act, to include animal trafficking. Until then, Ashe is warning museums and private collectors here in the US to treat animal displays the same way they would rare jewels or precious art. Dr. Kirk Johnson, the Director of the Smithsonian’s National Museum of Natural History, told us, “We have very good security on all the time, 24/7, watching all of our rare and irreplaceable objects. Things like the Hope Diamond, you can be sure that is amply protected." But what about Henry, whose giant tusks seem so easy to access? Dr. Johnson says don’t even bother. "The tusks are actually made of fiberglass. If we mounted the real tusks in ivory, it would pull the whole thing over it's so heavy. So our ivory tusks are behind glass and alarmed and safe and there's no fear our ivory will be stolen."